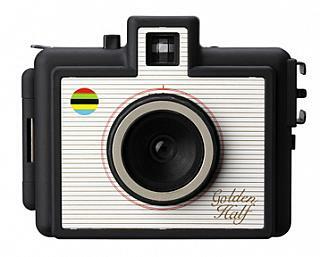 The Golden Half is a half frame 35mm camera. Half frame means that when you put a roll of 36 exposures into the Golden Half, you'll actually get 72 pictures. You can be quite carefree when shooting with it, but youâ€™ll still be shooting on film. Double fun in every way! The Golden Half is tiny enough to fit into most pockets, and it will never weigh down a small bag. It is so easy to carry around that you will never again miss an opportunity to create a great picture. It might be a tiny, rubber-coated plastic camera, but the Golden Half has a hotshoe on it, which allows you to attach any flash. This turns the Golden Half into a carry-anywhere, shoot-anytime, don't-worry-about-your-exposures (little) monster. The Golden Half features two apertures: f/11 for sunny skies or when using flash, and f/8.5 for cloudier times. The shutter and lens are fixed at 1/100 sec and 22mm, respectively.